The mighty mountain range of the Serra de Monchique is a dominant natural landmark of the western region of the Algarve, approximately 20km inland from the coast. The highest peak of this striking chain of mountains is Foia, which stands at a lofty 902m above sea level. The Serra de Monchique is the most southwestern mountain range of the Iberian Peninsula. This stunning range of mountains are carpeted in fragrant pine, eucalyptus and acacia plantations, interwoven with century-old donkey paths and trails that wind their way through the forests, up the mountainsides and eventually to the peaks, which offer enthralling views stretching in every direction. 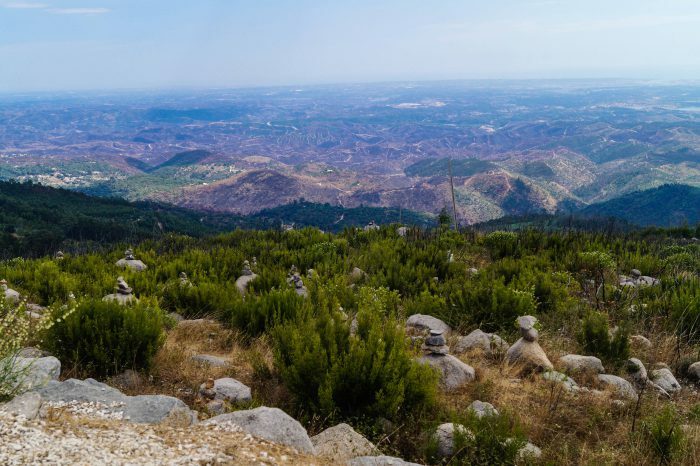 Walking in the Serra de Monchique provides the perfect place to get away from the hustle and bustle of the coast and escape to peace and solitude amongst the most spectacular of scenery. The mountains owe their name to Monchique, an alluring old town, with a characterful and historic centre and a popular spa site not far away at Caldas de Monchique where visitors can enjoy bathing in the hot sulphur springs. This quaint village with its narrow, cobbled streets and pretty 12th century church, is the perfect place to begin a walk in the Serra de Monchique. Upon leaving the charming old town of Monchique, the path soon runs into meadows and valleys of almond trees, orange groves and fig trees, as the scenery seems to become prettier with every step and the trail gently ascends the Monchique Mountains. For a fairly short but extremely rewarding walk, leave Caldas de Monchique and head to the summit of Picota, which boasts fabulous views of the town of Monchique and the surrounding countryside below. A gradual descent through pretty woodland eventually arrives in the heart of the Monchique, in the town’s tranquil village square.